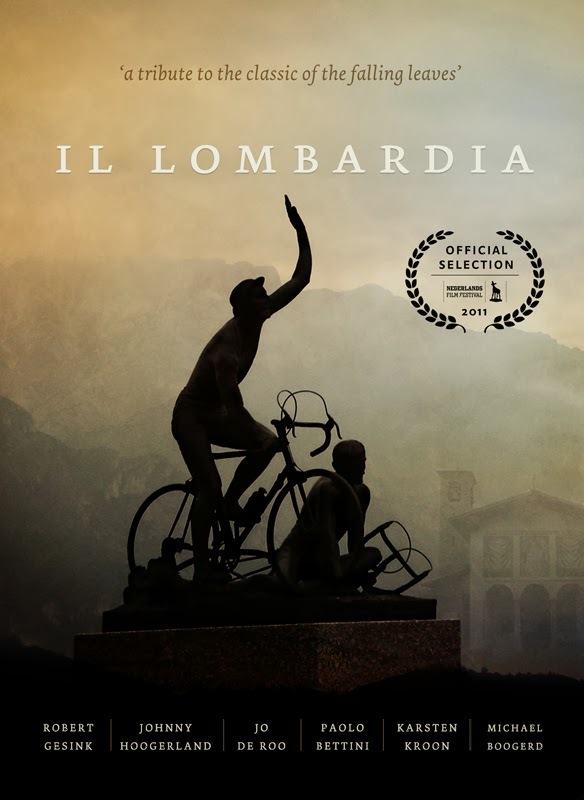 The critically acclaimed Dutch documentary "Il Lombardia" (the race was previously named Giro di Lombardia) is now available on iTUNES with Italian and English subtitles. The film, starring Robert Gesink, Paolo Bettini, Karsten Kroon, Jo de Roo, Johnny Hoogerland and Michael Boogerd is an attempt to capture the heart and soul of this legendary Italian bike race. Il Lombardia premiered at the Dutch Film Festival in 2011 and received stunning reviews. When the heavy scent of autumn starts filling the air, the falling leaves and inevitable showers announce one the toughest cycling classics. With its winding roads and steep slopes of 14% maximum, the Il Lombardia, also known as the 'Classic of the falling leaves', is pro cycling season's grand finale (tobe held Sunday). The century-old race in the Italian hills surrounding Lake Como has been won by Italian cycling heroes Coppi, Bartali and Moser. And also legends like Merckx, Hinault and Kelly made it to the podium. The 1962 edition is by far the toughest in the history of the race and was won by Dutchman Jo de Roo. Still every year Dutch pro cyclists participate to be a part of this great cycling tradition and in the end to gain victory. Just with one simple camera Dutch director Johannes Sigmond and producer Robert Jan van Noort visited the race from 2006 to 2010 in an effort to capture the soul of this legendary Italian bike race. They filmed and talked to Dutch participants, visited the famous climbs and tasted the atmosphere among Italian cycling fans enjoying their monumental meals and espresso while waiting for hours on the side to catch a glimpse of the riders.